successful fruition Oct. 20 at the 7IL Ranch in Cat Spring, Texas. Numbering nearly 100, volunteers lent their time and know-how for the event’s 26th year. 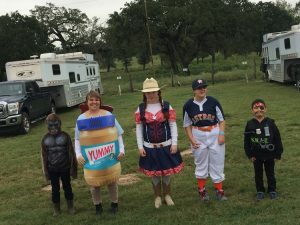 They registered supporters who brought their own horses to ride, logged their numerical predictions for the equine treat total in the jar and judged rider-horse costume combos. They set up and broke down dining and festival staging. They shoveled out the stalls and tended to the dozen specially trained therapy horses SIRE staff had hauled from three training facilities. They raised funds and donated. They cheered the riders and their families. 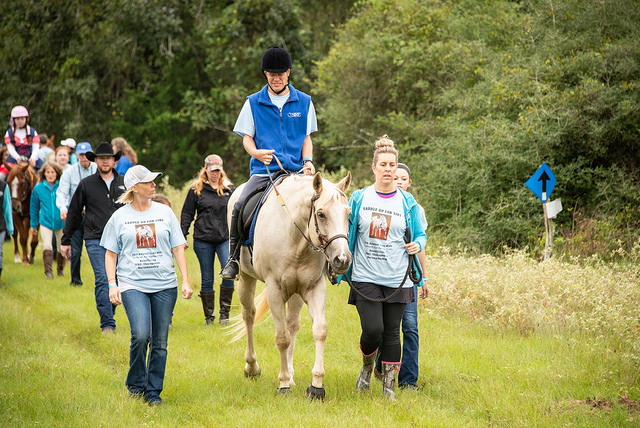 Chaired by SIRE board member K Leonard, a horsewoman since age 4, Saddle Up for SIRE has secured almost $95,000 in contributions to help fund rider tuition and horse care and feeding. Since its inception, the event has raised nearly $1.4 million. SIRE riding veterans Nathaniel Hunter and Lauren Igler—buoyed by the teamwork of family and friends—achieved the two top SIRE rider fundraising totals, which earned each of them trail boss slots to lead out the two trail rides, mile-high trophy towers and stylish commemorative belt buckles. 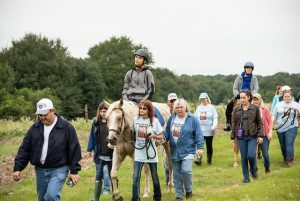 Long-time SIRE supporter Donna Rimmer earned the top fundraiser prize among those who brought their own horses to the trail ride, and K was recognized as the virtual rider who raised the most money. Halloween costume creativity achieved new levels of excellence again this year. SIRE riders and family members pleased attendees with a quintet of new twists on classic looks: (in photo at right, from left) King Kong Pumpkin (Isaac Estrada), Peanut Butter & Jelly (Carrie Prados), Cowboy Princess (Emileigh Marsh), Houston Astros Star Player (Lauren Igler) and SWAT Pirate (David Estrada). 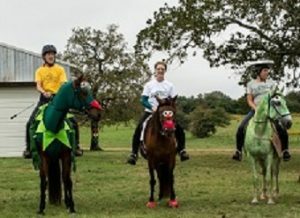 Winning the people and horse costume contest for riders who brought their own horses was The Muppet trio of Kermit the Frog, Miss Piggy and Oscar the Grouch (in photo at left). Despite soaking rain on the eve of the event, showers remained at bay on the big day, and overcast skies kept temperatures in the upper 60s. Participants journeyed from throughout Greater Houston and as far away as Galveston, Austin and the Dallas area to enjoy the festivities. In addition to its legion of event committee members and jacks-of-all-trade volunteers, SIRE would like to thank its lead sponsors: David and Faye Reznicek, who for 19 years have hosted Saddle Up for SIRE at their 7IL Ranch. SIRE 25 years ago; Ladana Igler, and her mother, Anna Mary Thomas, who refurbished 50 wooden horse-head centerpieces with detailed hand painting in the likeness of authentic horse breeds—15 of which were sold as fundraisers; and to program emcee Don Teague of Teague’s Tavern in Round Top, who has chronicled Saddle Up for SIRE’s day-long program with kindness, wit and humor many times over the years. Thank you, everyone, for your generosity!